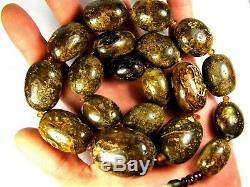 Black color natural genuine real Baltic Amber olive shape stones handmade unique large 152 grams necklace authentic women's jewelry. Ruler in the pictures is in centimeters. Scales shows weight in grams. 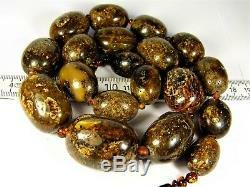 This item is 100% natural Baltic Amber. You get the exact item that you see in the pictures. Please take a look at the pictures. 66 centimeters / 26 inches. Biggest olive shape stone: 38 x 30 x 28 millimeters / 1.50 x 1.18 x 1.10 inches. 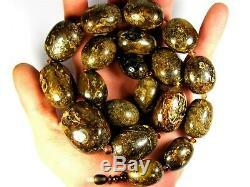 Smallest olive shape stone: 23 x 17 x 17 millimeters / 0.91 x 0.67 x 0.67 inches. Biggest stone: 7 x 7 x 6. Millimeters / 0.28 x 0.28 x 0.24 inches. 5 x 4 x 3 millimeters / 0.20 x 0.16 x 0.12 inches. The item will come packed safely. If you are not happy with the item or would like to return it, please contact me first. I will do my best to find best solution for you. You can return the item within 60 days after you receive it. Please contact me for any questions. And be sure to add me to your. What is the Baltic Amber? 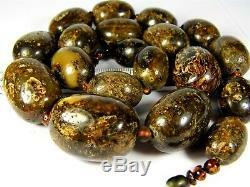 Amber is solidified resin of conifers. According to the scientists, Baltic Amber formed 50 million years ago during Eocene epoch, when the massive subtropical forests were growing in The Baltic Sea Catchment Basin. Fallen resin with the lapse of time has naturally solidified and deteriorated into amber due to processes of oxidation and polymerization. Most of it have been collected by the running rivers and drifted to the Baltic Sea. Plants, insects and other wildlife tailings have been adhered to the drifting resin. Plants and organisms inside amber are called inclusions. It is believed that during Eocene epoch subtropical forests could produce approximately 100,000 tons of amber. 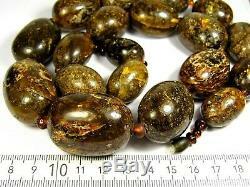 Baltic Amber consist a great amount of succinate (amber acid), therefore it is called succinite. How to identify true amber? Nowadays the price of a natural amber constantly raises. This causes massive amber counterfeiting. 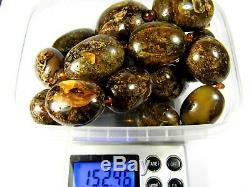 I will briefly describe the most popular and commonly-used falsifications of amber and the ways to identify true amber. 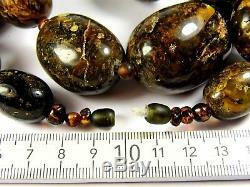 Glass is quite unpopular material for counterfeiting amber for a very simple reason. Glass is heavier, harder, colder and incombustible. Copal is a resinous substances in an intermediate stage of polymerization. Generally it is young resin (1000 to 1 million years). Melting temperature of copal is low comparing to amber. It may also have natural inclusions, but usually they are falsified. Phenolic resin is a synthetic resin produced in artificial way. Generally phenolic resin beads are identical to each other in shape, colour and looks. Regarded to be the first thermoplastic. Usually it is yellow and cloudy and looks similar to the true amber. Casein is a plastic made from cows milk. It is a little bit heavier than amber and have cloudy, turbid yellow colour. Optically this substitute can hardly be distinguished because with it authentic amber colors and limpidity can be obtained. Falsified inclusions are too big and clearly seen, usually inserted in the very center of plastic. There are many various ways to identify true amber. I will describe only two ways which are the most suitable for domestic conditions. Mix 15ml of table salt with 100ml of water. Dissolve salt in water by stirring. As salt is completely dissolved, drop the piece of amber into the mixture. Note that some additional components of jewellery such as string, fastener etc. Can drown the amber due to big weight. Amber, copal and some sorts of plastic should float in such mixture whereas glass and other plastics sink. Take a needle and heat it over the flame (use pincers to avoid skin burns). Stick a heated needle into an imperceptible place in amber. Copal and amber diffuses definite pine-tree resin smell whereas other sorts of fake amber plastic etc. Will smell like burning plastic. However, amber is fragile and it does not melt. Sticking with a hot needle you will notice some cracks, while a needle will pierce plastic and copal without cracking it. The hot needle test is the most effective way to identify true amber and it does not require any sophisticated equipment. The only negative of this test is the slight mark of burning remains which is irreparable. The item "Natural genuine real Black Baltic Amber olive shape necklace 152g authentic 1gin" is in sale since Friday, December 7, 2018. 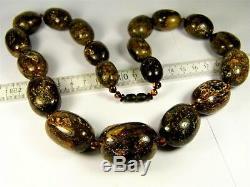 This item is in the category "Jewelry & Watches\Handcrafted, Artisan Jewelry\Necklaces & Pendants". radz" and is located in Vilnius. This item can be shipped worldwide.